Under the direction of Latha Venkataraman, associate professor of applied physics at Columbia Engineering, researchers have designed a new technique to create a single-molecule diode, and, in doing so, they have developed molecular diodes that perform 50 times better than all prior designs. Venkataraman’s group is the first to develop a single-molecule diode that may have real-world technological applications for nanoscale devices. Their paper, “Single-Molecule Diodes with High On-Off Ratios through Environmental Control,” is published May 25 in Nature Nanotechnology. “Our new approach created a single-molecule diode that has a high (>250) rectification and a high “on” current (~ 0.1 micro Amps),” says Venkataraman. “Constructing a device where the active elements are only a single molecule has long been a tantalizing dream in nanoscience. With electronic devices becoming smaller every day, the field of molecular electronics has become ever more critical in solving the problem of further miniaturization, and single molecules represent the limit of miniaturization. The idea of creating a single-molecule diode was suggested by Arieh Aviram and Mark Ratner who theorized in 1974 that a molecule could act as a rectifier, a one-way conductor of electric current. Researchers have since been exploring the charge-transport properties of molecules. They have shown that single-molecules attached to metal electrodes (single-molecule junctions) can be made to act as a variety of circuit elements, including resistors, switches, transistors, and, indeed, diodes. They have learned that it is possible to see quantum mechanical effects, such as interference, manifest in the conductance properties of molecular junctions. Since a diode acts as an electricity valve, its structure needs to be asymmetric so that electricity flowing in one direction experiences a different environment than electricity flowing in the other direction. 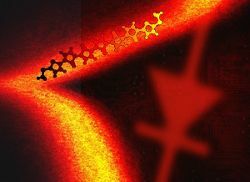 In order to develop a single-molecule diode, researchers have simply designed molecules that have asymmetric structures. “While such asymmetric molecules do indeed display some diode-like properties, they are not effective,” explains Brian Capozzi, a PhD student working with Venkataraman and lead author of the paper. “A well-designed diode should only allow current to flow in one direction—the ‘on’ direction—and it should allow a lot of current to flow in that direction. In order to overcome the issues associated with asymmetric molecular design, Venkataraman and her colleagues—Chemistry Assistant Professor Luis Campos’ group at Columbia and Jeffrey Neaton’s group at the Molecular Foundry at UC Berkeley—focused on developing an asymmetry in the environment around the molecular junction. They created an environmental asymmetry through a rather simple method—they surrounded the active molecule with an ionic solution and used gold metal electrodes of different sizes to contact the molecule. Their results achieved rectification ratios as high as 250: 50 times higher than earlier designs. The “on” current flow in their devices can be more than 0.1 microamps, which, Venkataraman notes, is a lot of current to be passing through a single-molecule. And, because this new technique is so easily implemented, it can be applied to all nanoscale devices of all types, including those that are made with graphene electrodes. She and her team are now working on understanding the fundamental physics behind their discovery, and trying to increase the rectification ratios they observed, using new molecular systems. The study was funded by the National Science Foundation, the Department of Energy, and the Packard Foundation. I appreciate your work...Keep Posting. Wow.. You wrote a very good information regarding the one step closer to single molecule..
One of the best article you wrote here.. Thank for adding the valuable information.. The best Online Exam Software for SSC, BANKING, RRB, IIT, NEET and other exams. ALL STUDY NOTES OF SSC, BANKING, RRB. ONLINE TEST SERIES FOR IBPS, RRB, SSC etc. Railway recruitment Board Gorakhpur is taking complete responsibility to announce RRB Gorakhpur Group D Result. There are so many things which can easily be checked from here. On below of this passage, we have mentioned list of important things which you all should check. In just some days, all candidates will be able to check the Railway Gorakhpur Group D Result 2019.